This week I have asked David Thorp share some thoughts with you about the Catholics Come Home program, which invites inactive Catholics to once again return to the faith. David will be heading this important initiative that we will be beginning in the archdiocese in the coming months. 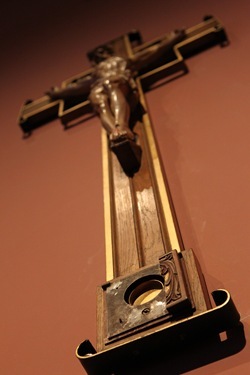 However, before we get to David’s comments I would like to say a brief word about an event many of you may have heard about in the news this week: the theft of the relic of the True Cross of Christ from our Cathedral. This relic has significance for us as Catholics here in the Archdiocese of Boston. First of all, we believe that this relic is an actual piece of the Cross on which our Savior died to take away our sins. His death on the Cross, and His rising from the dead on Easter Sunday are the central event of our redemption. Relics are usually physical object that link us to one of the saints in heaven. In the case of this relic, however, the link is to an actual event in history, the most important event of human history. 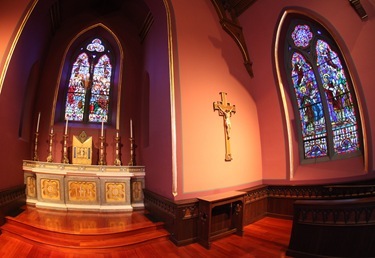 The other reason this relic is so significant to us is that it has been in the Archdiocese of Boston for over two hundred years, going way back to our first Bishop, Bishop Cheverus. 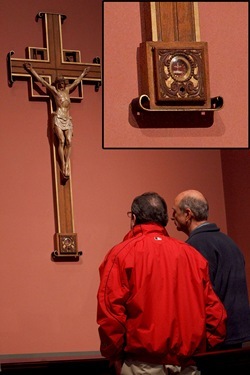 I would ask Catholics throughout the Archdiocese to pray for those involved, and that this relic will be returned to the Cathedral of the Holy Cross, where it has been enshrined and venerated for over two centuries. Recently Steve LeVeille, a radio talk-show host in Boston, caused quite a stir in area supermarkets. Steve, who has made no secret of enjoyment of outdoor grilling, spoke with enthusiasm about a particular salad dressing for marinating meat. Immediately the salad dressing was flying off the shelves. One man, a few nights later, said that he went to five different markets before he could find a bottle. Others called in to share their delight in the way the dressing boosted the taste of meat they had grilled. Even now, weeks later, this remains a topic of conversation on Steve Leveille’s show. Steve LeVeille had found something good, something new, something surprising. And, he just couldn’t think of keeping it all to himself. He wanted people to hear about his good find and the tasty goodness of his grilling experiment. I marvel at what Steve has done for a marinade, a delightful — but passing — taste. I have tasted something even more delightful, something that does not pass away. The words of Psalm 34 ring true: “taste and see the goodness of the Lord.” Many years ago, after some years of deep anger at God and disdain for the Church, I was surprised on a retreat by God’s love and mercy. I discovered in a way that I had not known before the one who could satisfy the deepest hungers in my heart. The amazing thing for me is that the retreat was only the beginning. There has been a continuing and ever-deepening ‘discovery’ of God and life with God through Jesus Christ and in the Church. I’ve come to know God as life and light, shepherd and strength, wisdom and the way, peace and power for living. Through the Church, the Body of Christ, I have received comfort through the proclaimed Word of God and through the sacraments. In times of struggle and distress the community has been the healing and sustaining hand of God for me. It has also challenged me to live more fully for God and for others, stretching me so that I could be all that God has created me to be. Mine is not a unique experience. Millions upon millions of people have come to know God in this same way. God has been peace for their troubled hearts, power when they felt completely drained of strength, truth when they were confused, the way when they didn’t know where to go, light when they felt engulfed in darkness. At Mass, they have been fed by the Living Word of Scripture and the Living Bread of the Eucharist, Jesus himself. In the Sacrament of Reconciliation, they have had the burden of guilt lifted and have known beyond doubt that God’s tender mercy is for them. It is an extravagant feast that God shares with me, with us. God shares it freely — we didn’t have to, nor could we, earn it. God shares it freely — holding nothing back, giving all and inviting us to receive all. How could I, how could we keep this to ourselves? Those who have received the Good News and who have been gathered by it into the community of salvation can and must communicate and spread it. The Church knows this. She has a vivid awareness of the fact that the Savior’s words, “I must proclaim the Good News of the kingdom of God,” apply in all truth to herself. She willingly adds with St. Paul: “Not that I boast of preaching the gospel, since it is a duty that has been laid on me; Woe to me if I did not preach it.” … [T]he task of evangelizing all people constitutes the essential mission of the Church. … Evangelizing is in fact the grace and vocation proper to the Church, her deepest identity. She exists in order to evangelize. Father Henri Nouwen, the great spiritual writer, has helped me to understand how I can live out my Catholic identity as an evangelist. “Evangelization,” Father Nouwen stated, “is one beggar showing another beggar where the bread is.” How rich a description! It speaks about our attitude when we evangelize. It speaks about what we are to do as we share our faith with others. Attitude. Father Nouwen’s description reminds me that I am a beggar also. I am neither the owner of the bakery where the bread is made nor of the shop were the bread is sold. I, too, am a beggar who is hungry and in need. Action. But, I have been fed! And, knowing that there are other beggars, other people who are hungry, I must show them where the bread is. I can’t just send them to where the bread is: “You go, first six blocks, turn left and go five more blocks …” I must be with them, walking beside them, saying, “Come with me, this is the way to the place where I have found bread.” As I have thought about Father Nouwen’s words I have imagined the conversation. I would be listening to the other’s story, seeking to understand the fellow beggar’s situation. I would recall the person who first showed me the bread. I would speak about how the bread tasted, remembering what it was like to have hunger satisfied, think aloud about the many different kinds of breads and how they might taste. I’d ask if there are others who should be invited. We meet hungry people all the time. They are members of our families, our neighbors and co-workers; sometimes they are people we’ve just met. Sometimes they are burdened by worry or anxiety. They are filled with anger or resentment. They feel alone. They talk about drifting without any direction. Or, they say that it’s too late for them and the direction for their life is so set that there can’t be change. They say day-to-day stresses are so overwhelming to them that they feel like they are drowning. They wonder, “Is this all there is?” In our daily conversations, when we really listen, it’s amazing how many times people are asking for “bread.” How hungry they are for some good news. How hungry they are for The Good News, Jesus Christ, and for the community where The Good News is shared and celebrated, the Church. One new way that the Archdiocese of Boston is responding to God’s call to share the Good News is Catholics Come Home. In conjunction with CatholicsComeHome.org, a national Catholic lay apostolate, we will ask people to take another look at the wonder of God’s life for them, at the immeasurable love of God for them. We will invite them to discover — or re-discover — God’s feast for them in the Eucharist and, indeed, in all the dimensions of the Catholic life. Wanting to reach as many people as possible, three commercials will be aired. These inviting and positive messages were developed by CatholicsComeHome.org and have already been seen in Seattle and Sacramento, Chicago and Corpus Christi, Phoenix and Providence, Green Bay and Omaha. These television commercials — which will be aired next Lent — will enable our invitation to reach people in their own homes. We will extend a message of hope and welcome to many people whom we might not otherwise be able to reach. The response in other parts of the country has been exciting. People made phone calls to parishes and to diocesan offices. 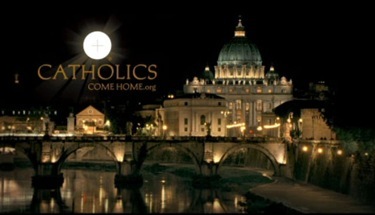 They visited web sites – parish websites, diocesan websites, CatholicsComeHome.org. They sent emails with questions that had been troubling them. Their faith was renewed. They received God’s love afresh as they returned to Mass, participated in special “welcome” programs, went to confession after many years away. Aware that commercials alone are not enough, parishioners in other parts of the country where the spots aired also reached out with more personal invitations. The commercials provided an opportunity to start a dialogue with others. Even as people shared how being a Catholic had brought meaning and peace in their lives they spoke about everything you could imagine — people’s longing for God, questions about marriage and divorce, prayer, desire for community, sexuality, the stress of unemployment, suffering, the meaning of life. The deep grief and broken trust that people experienced related to clergy sexual abuse were also part of these conversations. People reflected together on their experiences as Catholics, both positive and not-so-positive, seeking the presence of God in the complexities of life. Boston isn’t any different. The involvement of priests and parishioners will be vital. Ads, as good as these are, come on a flat screen; the message flows in one direction. You and I can offer 3-D, live words of invitation and welcome; the message becomes very interactive. 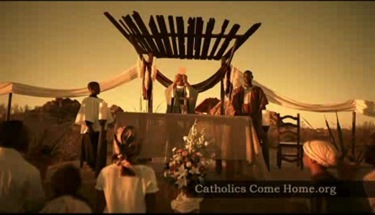 Catholics Come Home is one more new way that Catholics in the Archdiocese are sharing the Good News of Jesus Christ. ARISE Together in Christ, now into its third year of bringing Catholics together to share faith and pray with each other in small groups, has added so much to the lives of thousands of people in more than 180 parishes. Through The Light Is On For You people are experiencing the depth of God’s mercy in the Sacrament of Reconciliation. This healing ministry has helped many to remember that God is always offering a new beginning. Evangelizing – sharing faith with others – is what I can do. Making hearts new, changing hearts is what God does. He does this by pouring out his love and grace. I am praying that hearts are ready to receive all that God offers every day. All of us know people who are distant from the life of the Catholic community. They are our children and grandchildren, husbands and wives, brothers and sisters. I’ve written names of people I know in a book. Co-workers at the Pastoral Center have added the first names of others. It’s getting to be a long list. These people are loved and they are a gift. We miss their active presence in the community of faith. I pray for these people. 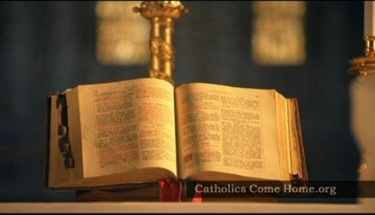 I carry the book with me to Mass so that I can especially offer them to the Lord and his love. I am also paying attention to the words of St. Peter: “Always be ready to give an explanation to anyone who asks you for a reason for your hope.” [1 Peter 3:15]. Most of us won’t be able to broadcast to 30+ states as does Steve LeVeille. But each of us can speak to another person about the hope and faith and peace that we know because of God. I am thinking about who Jesus is in my life and why I follow Christ. I am thinking about the reasons why I am a Catholic, why I participate in Mass. I want to be ready to share with others. Let’s look and listen – even now – for a chance to tell hungry people where we have found the bread.